In recent weeks Twitter has changed the way that third parties can use their information. 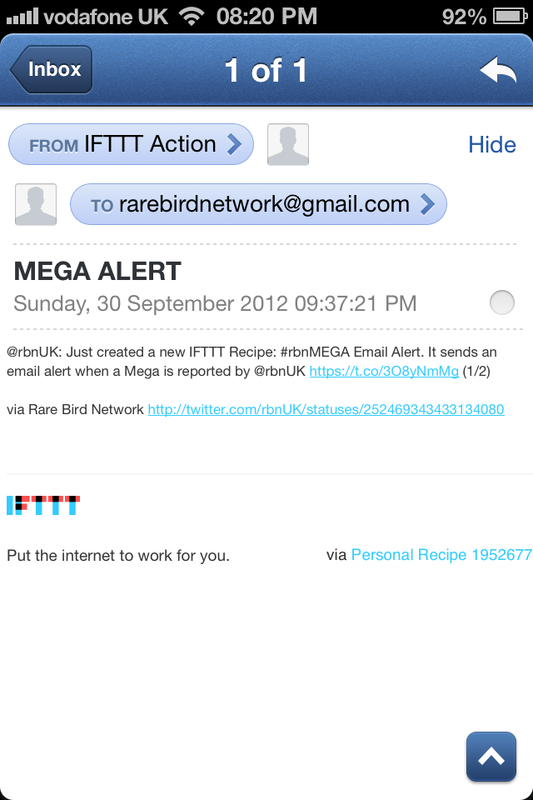 This unfortunately means that (for the present time at least) IFTTT can no longer provide hashtag alerts. There are a few other methods of receiving alerts on your phone so here's a couple of options. If you don't have an Android device there are less options. 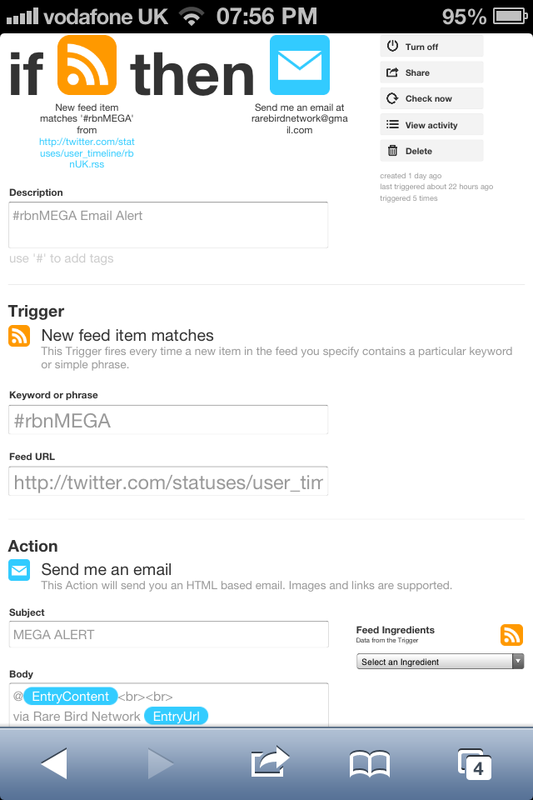 Firstly I'd recommend that you sign up to request Hashtag Alerts to be supported by Hootsuite... click just here. Hootsuite say that this is currently under review so the more people who cast their vote the more likely it is to be included. Even if you've got an Android device I'd still recommend that you add the request to Hootsuite as it will give you an alternative method that you may actually prefer. This will mean that you won't miss a thing. Although using this method means that you can't select which hashtags you're most interested in and you also won't receive alerts when somebody else uses the hashtag. At Rare Bird Network we're constantly on the look out for ways to improve the service for you and enable you to receive free bird sightings information. If you know of any other methods please do get in touch. With more people now adopting the Rare Bird Network hashtags it seems like a good idea to go through a brief "best practice" guide on how to tweet when you're using one of the hashtags. A few common errors are highlighted in the tweet below. Firstly, starting a tweet with @rbnUK means that the only people who can see it are Rare Bird Network and those following Rare Bird Network and you. 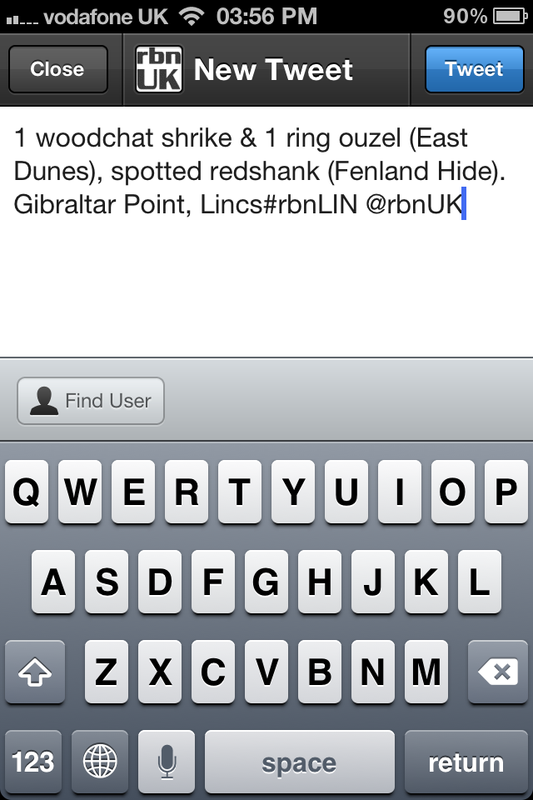 By adding @rbnUK later on in the tweet, the tweet will be seen by all your followers and Rare Bird Network. This means other people can pick up on your tweet and give it a retweet without our involvement, increasing the chances of the news spreading more quickly. Remember, it's not essential to put @rbnUK on every tweet, just copy us in if you really think it'll be of interest to people outside your county. Secondly, although it's a nice record of birds they're probably not of great interest to many other people. For this reason it's best to avoid tweeting very common bird species (unless, for example, it happens to be a really good count of species at a migration hot spot, or an interesting record for the county). There are no hard and fast rules but have a quick think before tweeting and tagging. If you're a bit unsure on what birds not to tweet about there's a list of common species at the bottom of this blog post that should generally not be included in the tweet. Although you may decide that you want to include one or two of them whilst tweeting about a less common bird. The tweet below is much better, it covers several species that would be of interest to the majority of birders and the @rbnUK is not at the start of the tweet. The problem with the tweet below is there's no gap before the hashtag #rbnLIN. If there's no space before and after the hashtag the hashtag won't work! Also, try to make sure when using the hashtag that the county part is in capitals. In the example below #rbnLIN has been as opposed to #rbnlin this makes it much easier to see which county/region is being referred to. The next tweet is perfect, there's plenty of information and it's concise and to the point. Although not essential, the main species has been highlighted using capital letters directing the reader of the tweet to the "star bird". 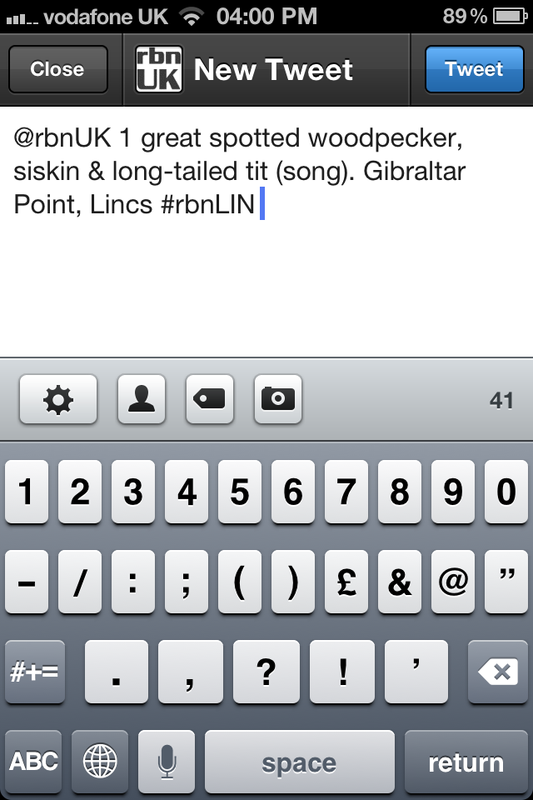 ﻿Below is a good example of how to use the hashtag #rbnMEGA It gives more detail of how to find the bird (which has again been highlighted using capitals) and all other species have been omitted. @rbnUK has again been added so we can make sure it gets a retweet to all Rare Bird Network followers. Do use capital letters to highlight the "star bird"
Thanks for taking part in Rare Bird Network! Over the last few weeks here at Rare Bird Network we've been busily trying to find a way of setting up a system so that when we send a tweet with a specific hashtag you can receive an alert on your phone. Now we've found out how! I'd originally started looking at whether it was possible to be alerted by one of the big Twitter clients (Hootsuite, Tweetdeck or Tweetbot). I looked into it and discovered that Tweetdeck originally offered this service but it had been removed (or at least it's been removed from the iPhone app). I've registered with them for it to be added to future upgrades so if anyone would like to see this too then get in touch and I can send you a link so that you can also register your interest. 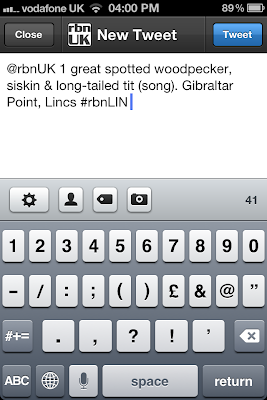 Then just yesterday one of the rbnUK followers, Londonbirder69 tweeted that he'd found a site for Twitter alerts! The site is called ifttt.com and basically you create a search and when that search is found an alert is sent either by email or SMS. There are various other functions to be played around with but for us those are the most interesting. ﻿With this set up the next thing to do was give it a test, send a tweet and include the hashtag. Once the tweet was sent it was just a matter of sitting back and waiting for the email to arrive. The email alerts seem to take up to a maximum of 30 minutes but are generally much quicker. I've no idea how long it takes for an alert to be sent out from one of the paid services, but this is a completely free bird alert service! 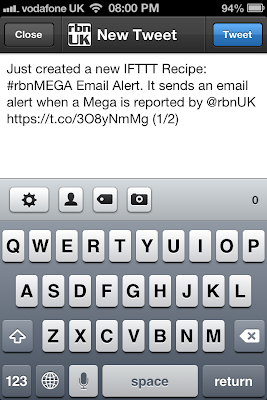 So if you want alerting the next time we tweet #rbnMEGA or one (or more) of your local area hashtag codes get over to ifttt.com and register for an account. It's pretty straightforward to set things up and should only take a few minutes. 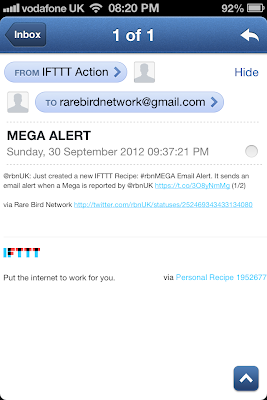 Once registered, follow this link https://ifttt.com/recipes/59615 to receive an email alert whenever we tweet about a new mega turning up. If you want you can alter the "recipe" for example you can change how you receive your alerts, if you'd rather receive them by SMS or Pushover. It's also possible to alter the hashatg so that you'll receive an alert whenever we tweet about a bird in a county of your choice. I understand that SMS messages are charged for at your providers basic rate, though I have not yet tried the SMS service myself so cannot confirm it. At some point in the future the plan is to have an all singing and dancing Rare Bird Network app, but as everything is self funded at the moment this may take a while to reach fruition. So until that day this is a fantastic work around. I'd really like to thank Londonbirder69 for getting me on to this, without their input it would undoubtedly have taken much longer for a decent alert service to be set-up. If anyone else has any other suggestions or comments on ways of receiving phone alerts please get in touch. UPDATE: Unfortunately Twitter have recently changed the way that third parties can use their information. 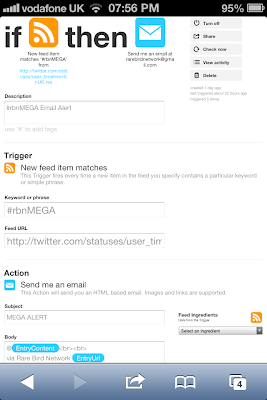 This means that (for the present time at least) IFTTT can no longer provide hashtag alerts. Please click on this link for alternative methods of getting alerts sent to your phone. Just last week my eagerly awaited copy of Extremely Rare Birds in the Western Palearctic by Marcel Haas fell through the letterbox and on to the doormat. The book was released back in February and I had already read a little about it over on BirdForum and more recently read the Birdwatch Review and intrigued by what I had read I decided to buy myself a copy. It has a RRP of £25, although it is currently on offer (there's a link at the bottom of this review). 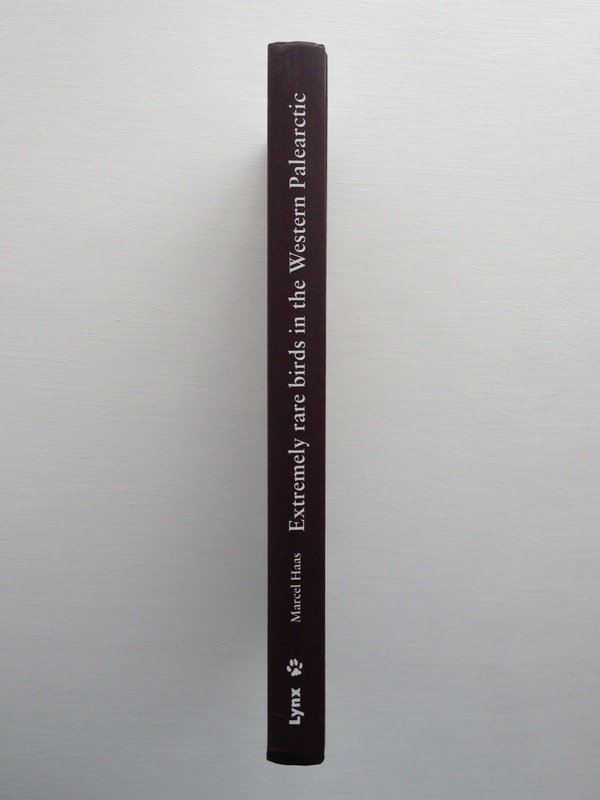 The book is available only as a hardback and is roughly the same size as the average Poyser monograph (24 x 17 cm). My first impression, as I removed the bubble wrap was a good one, as I was welcomed by the fantastic image of a Yellow-bellied Sapsucker on the front cover. The book is 244 pages long and contains over 300 colour photographs, some of the images contained in this book are published for the very first time. A slight bugbear of mine is when the title of the book is written "upside down" on the spine (I know...I'm picky). I'm not sure if this is a continental thing but to me it just doesn't look right, maybe I've just got a little bit of OCD. But the most important thing about any book is of course the content. The book describes the 155 species of birds that have occurred less than ten times in the Western Palearctic (Europe, North Africa and the Middle East) and have been accepted by the relevant rarities committees. The book covers the period from 1800 to 2008 although three species recorded since then (African Openbill, Asian Koel and Ashy Drongo) are added as an appendix. Each species account starts with a description of the bird's distribution and movements. I personally would have preferred to have seen this summarised in a map, as if your knowledge of geography isn't great you might struggle a bit picturing the normal range of the species being described. The records are then briefly described (sometimes just a bit too briefly) including important records that have been rejected, when most records have occurred and other such details. For each species there is also a table, listing alphabetically by region where and when each record occurred. This I feel would have been better presented chronologically, so that each species account started with the earliest record and ended with the most recent. The images include many museum specimens either mounted or as skins. Some of the older records I must admit to often having a little doubt over. I guess my opinion has been clouded by the "Hastings Rarities" records and the Meinertzhagen Bird Collection. So it was both interesting and reassuring to read the comment that four spectacled eiders recorded by Meinertzhagen in Russia should be considered doubtful. Although the museum specimens are of interest, I personally feel that they don't offer a great deal to the book. If no photograph of the actual wild bird was available I would have rather seen an image of a different bird. I want to see what the bird really looks like! 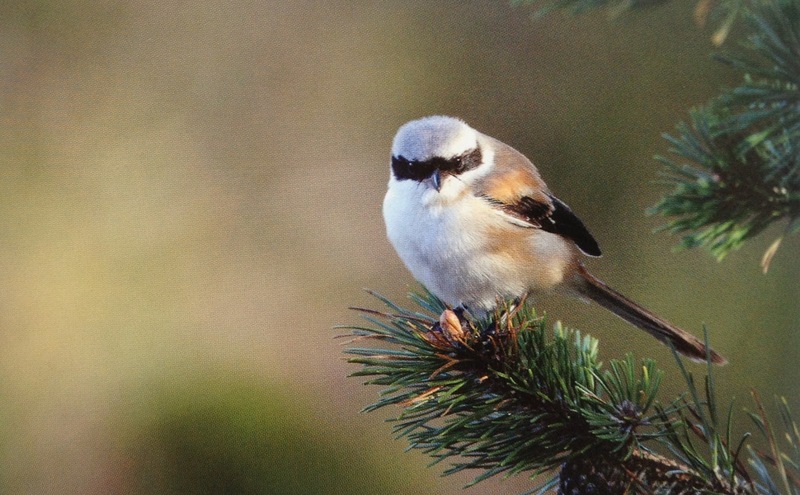 So after seeing the rather sad looking Long-tailed Shrike (right) I was pleased to turn over the page and see this beautiful image (below) taken by Ole Krogh. It's a shame that there aren't more images like this throughout the book. 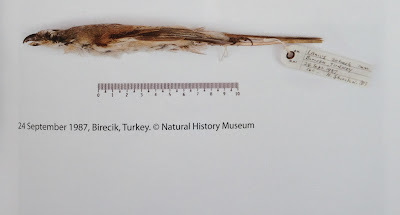 I completely understand why the author has chosen to use the museum specimens but in my opinion the book would have been enhanced with more high quality images. On several occasions there is a photographic record shot of the bird within a group of other birds and it's not automatically obvious which bird is the rarity. This could have been very easily remedied in the photo caption. Conclusion: Due to the lack of any maps and not putting the records into chronological order it is often quite difficult to quickly retrieve the information on a given species. This combined with the lack of more "useful" photographic images means the book doesn't quite reach it's full potential. But this is still a worthwhile book to have. The author has gone to a lot of trouble gathering all the information and photographs together and it's great having all that information readily at hand. It's not really a book to read cover to cover but it is nice to dip in and out of to help whet your appetite for what might be waiting for you out there. 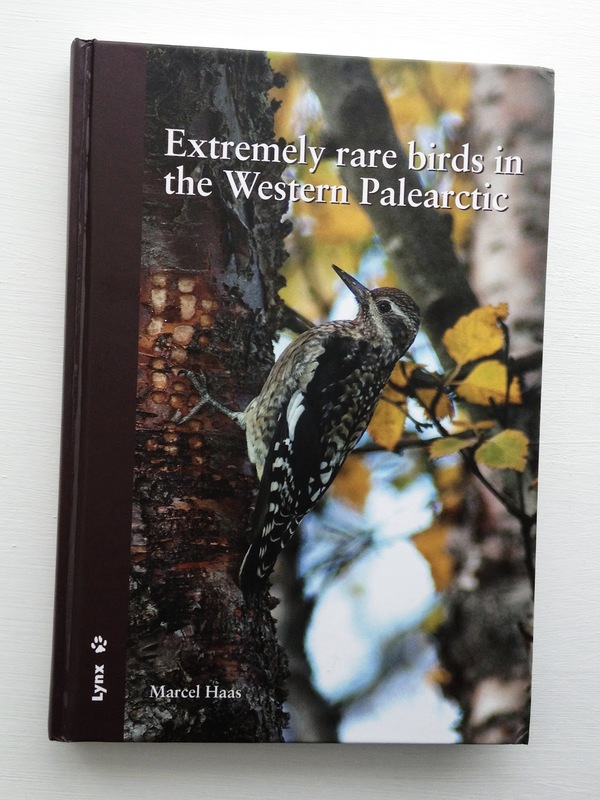 Extremely Rare Birds in the Western Palearctic is published by Lynx Edicions, Barcelona, (ISBN 978-84-96553-83-5). To see more plate images and a full list of contents visit the Lynx Website. We've been busily Tweeting away for just under three weeks and the Rare Bird Network website was launched two weeks ago. So, what's happened in this time? With over 150 Twitter followers and almost 1500 web hits there's certainly been a good deal of interest. Numerous hashtags are now being regularly updated by some of you, notably #rbnSFK #rbnKEN #rbnLND and #rbnGWY There are several other hashtags now in use but those mentioned are perhaps the most active at the moment. So if you've not adopted a hashtag yet, what's stopping you? One possible reason is that you already use a different hashtag. If you bird in London maybe #LondonBirds or if you're a Gloucester birder #GlosBirds. But there's really no reason why you can't use an RBN hashtag as well, it only uses 7 characters of the 140 you can use in your Tweet! If sometimes you can't fit in one of our hashtags it's no great loss but the more you use it the more you'll help the increasing number of birders who are using Rare Bird Network. We're obviously not going to see an overnight change in the way birders use Social Networking but it's hoped that rarebirdnetwork.co.uk will become a bit of a central point where people can visit us and pick up the relevant information that they need to find out what's going on and where. That's why we're also developing a comprehensive map of blogs and websites that are all regularly updated with bird sightings from across the UK. "...Have you seen this? Looks like beginning of a useful system...(it's) about setting up a national system. Need to introduce some common standards...Early days yet. Won't work if we don't all get involved." "I think we should all use the hashtags suggested by Rare Bird network; it will benefit all UK Birders..."
"Come on Birders start using #rbnUK"
"@rbnUK the very best of luck. You have my full support. #birding"
For Rare Bird Network to succeed it's all about you, it needs your involvement, it needs you to persevere, it also needs you to encourage others to become involved. By helping spread the message of what we're trying to achieve (a free bird sightings service that covers the whole of the UK) you can make it succeed. Below is a map with all the county/area hashtag codes for the UK. Just click on your nearest marker point and it will show you the relevant hashtag code. Clicking on the county (or area) name will open a link to the twitter feed for that county (or area). If the hashtag has been used in the last eight days all those sightings will be shown. 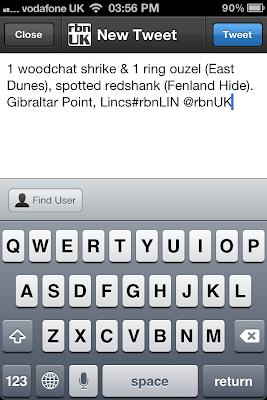 If no sightings are shown, why not start adding your own and get other local birders to do the same? Rare Bird Network @rbnUK is a new free bird sightings service. 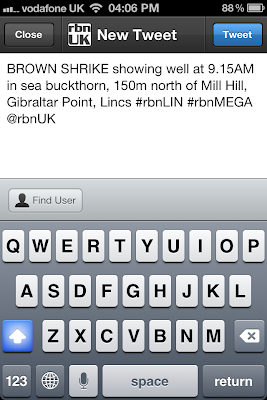 Rare Bird Network (RBN) uses the social networking site Twitter and works by using pre-defined hashtags for each county (or defined region) in the United Kingdom. If you click on one of the hashtags (for example the hashtag for Greater London is #rbnLND) it will take you directly to a list of all the sightings in Greater London that have been tagged in the last eight days. 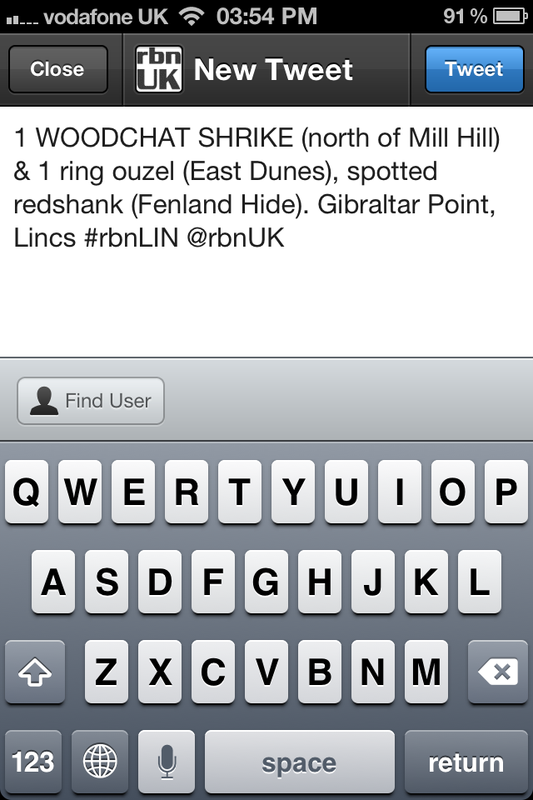 So, if ever you see a bird and tweet out the information make sure you hashtag it with the relevant county hashtag. The hashtags typically relate to the "Chapman County Code" a unique three letter code that relates to a specific region. In some instances a better (more logical) code has been used as an alternative. On occasion regions are also defined by grouping areas together such as with the Scottish islands. Where this has occured and no code exists a suitable code has been created. 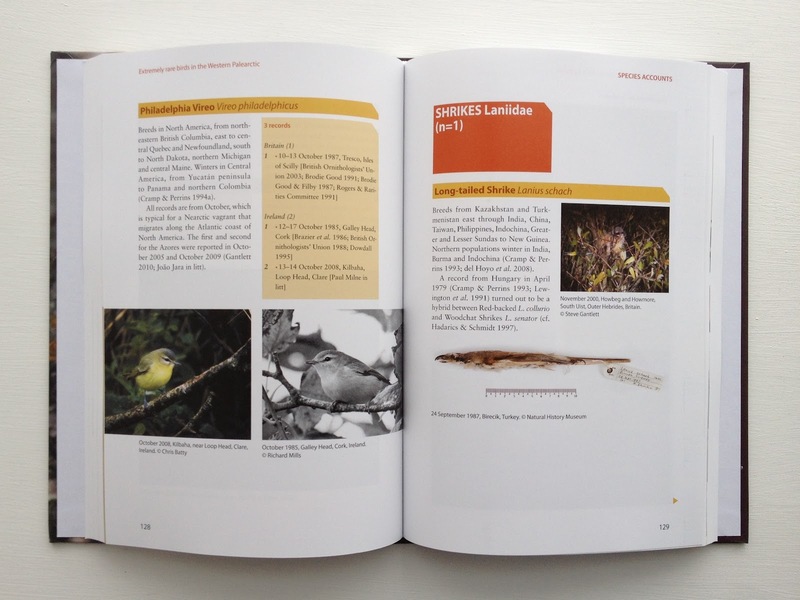 The regions are the same as those used by BirdGuides this is to make it easier for people who may also subscribe to one of their services. On that note, RBN is not considered to be a replacement for any of the popular bird alert services and it is hoped that it will in fact compliment them. If you subscribe to another service, don't just Tweet out an alert from that service, although if you find something noteworthy please do report it to RBN as well as your other service. 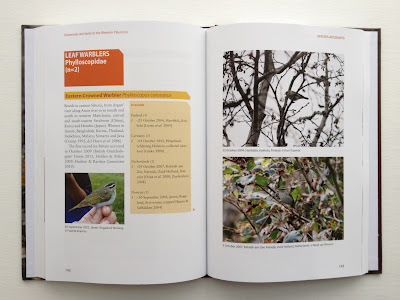 RBN, although it's name may suggest otherwise, is not just about extreme rarities, it's about any sighting that you think will be of interest to anyone who lives or may be visiting the county that you're recording in. Whether it's the return of a migrant bird, first record of a bird singing for the year, a good "patch" bird or a tricky "Year List" bird all sightings will be relevant to somebody else. 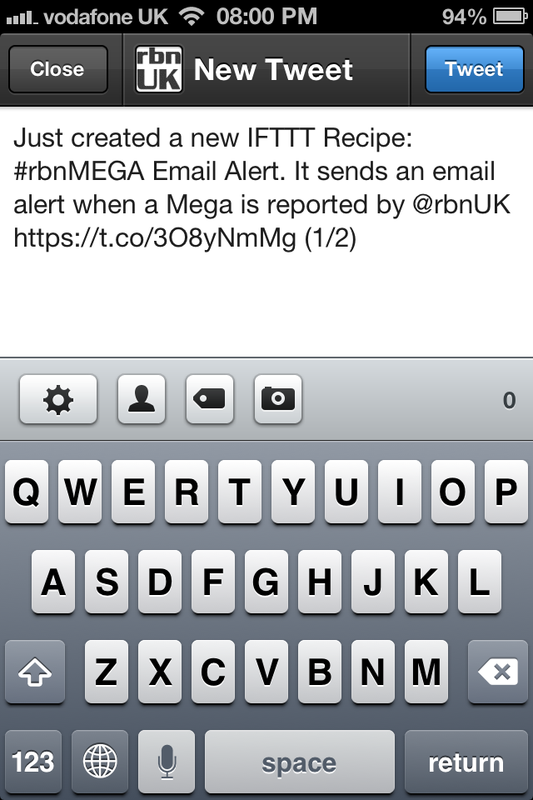 If you do happen to find a mega though be sure to hashtag it with #rbnMEGA as well as the area code. To get the most out of Rare Bird Network you have to put something back in to it. The more people who take part and add the hashtags to their sightings the more comprehensive the service will be. So please do add the relevant tag next time you Tweet a sighting and please encourage other friends/followers to do the same. Thanks for reading, feel free to comment.